2. Marinate chicken with the chicken marinade and leave for at least an hour or two in the refrigerator. 3. 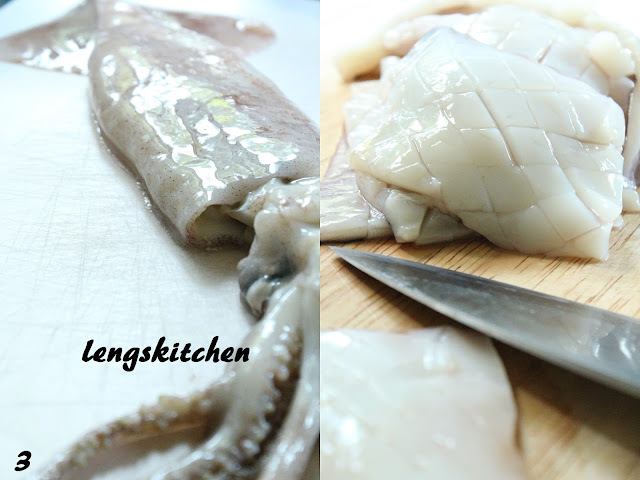 Cut the squid open, discard the innards. You can choose whether or not to keep the tentacles. Rinse clean. Half the squid lengthwise. Score the squid by making uni-direction cuts, diagonally. Be sure not to apply too much pressure that it cuts through the thickness. When done, score the squid in another direction, creating diamond-shape cuts. 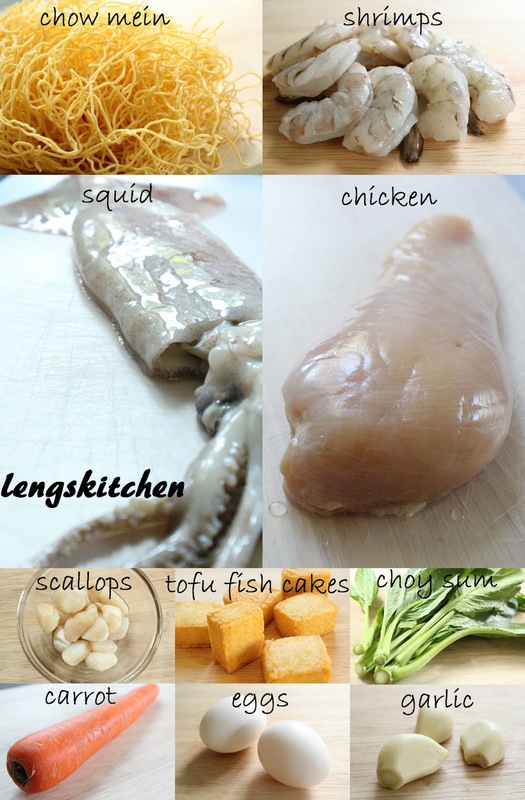 Cut the squid into smaller pieces after that. Set aside. 4. 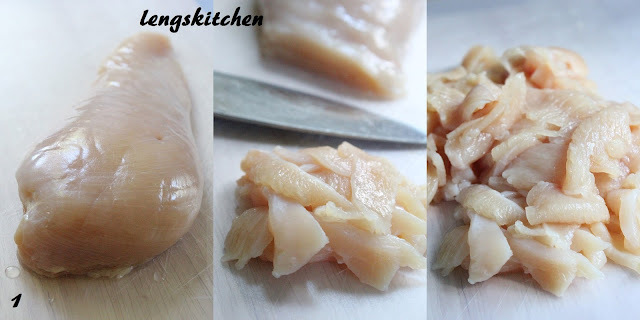 Slice the fish cakes thinly. 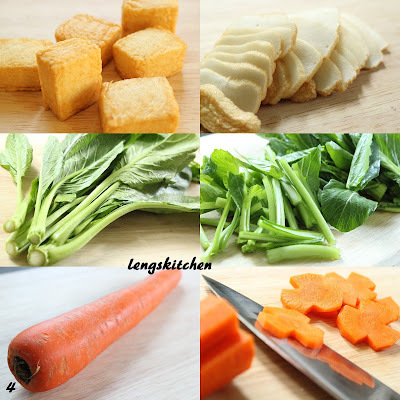 Cut the vegetables into 2" sections, separating the leaves and stems. Peel and slice the carrots. 5. Heat up enough oil for deep frying in a wok on high. Make sure the oil is well heated before deep frying. As usual, I tested its readiness using a wooden chopstick. Streams of bubbles seen signify that the oil is ready. Turn the heat down to medium-high. 6. In two separate batches, gently lower half the noodle, spreading them around the wok. The noodles will start to take shape in just a few seconds. Once it browns on the bottom, carefully flip it over to fry the other side. Remove and let rest on a plate lined with paper towels. Repeat with the other half of noodle. 7. Working on one single portion at a time, bring the cooking oil to heat on high in a large skillet. Once well heated, add in the minced garlic and stir-fry until fragrant, lightly browned. Add in the marinated chicken next. 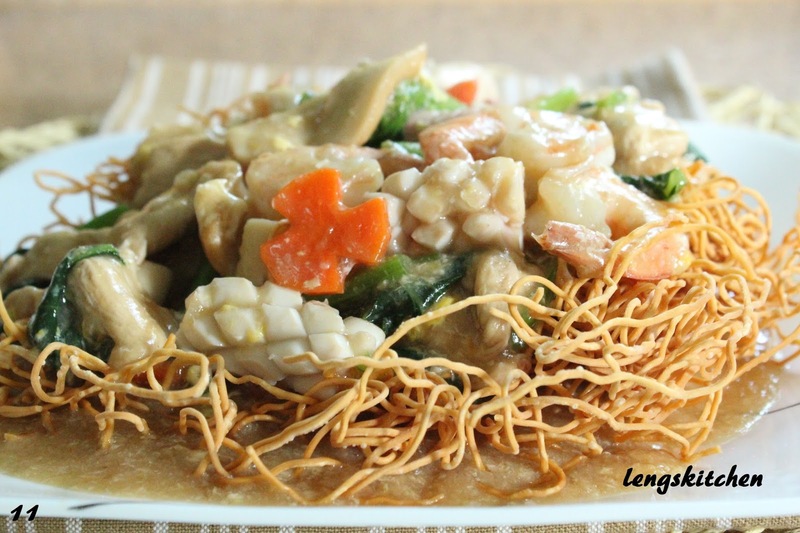 Break the clumpy chicken pieces up as you stir fry. Keep stirring until the meat changes color. The fish cakes and carrot slices go in next. 8. Pour in the gravy and bring to boil. Add in the choy sum stalks, let cook for about a minute, and add in the leaves next. 9. Add in shrimps, squids and scallops next. Thicken the gravy with the corn starch slurry. Add in about 1/2 a tbsp each time until it reaches your preferred consistency. You may want to work with a little speed here - those seafood won't taste as good when overcooked. 10. Break in an egg, and stir to mix everything well. 11. 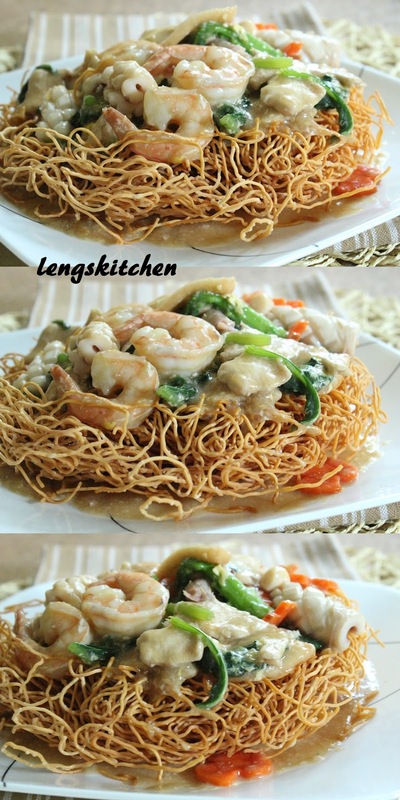 Transfer the noodle onto a serving plate. Ladle the gravy over the noodles. 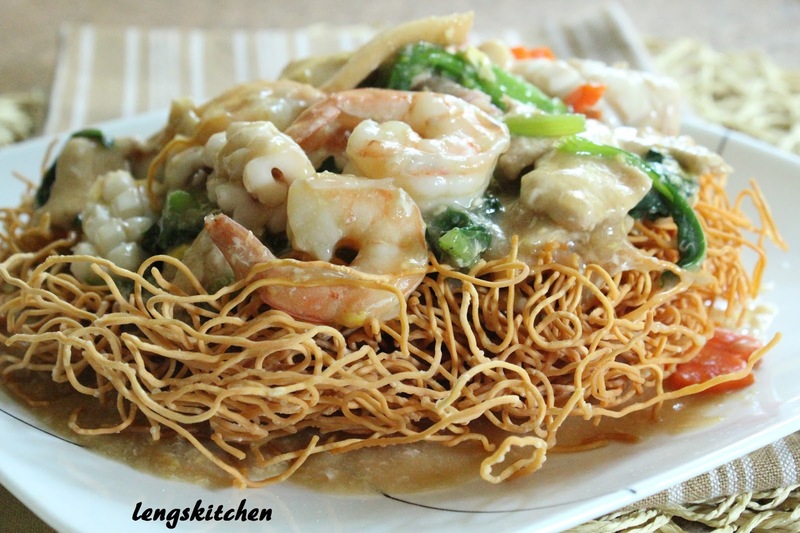 Serve with birds eye chilies (or pickled chilies) in soy sauce! p/s Optionally, you can choose to cook both portions together and separate them out at the end of it. It works fine either way. That looks very good- especially with the gravy and generous seafood! Great.. its really new for me first time I saw the Seafood Crispy Noodle and its looking so yummy.. Keep posting the mouth-watering recipe. When do you add the carrots? Orbdid i miss something? Hi there! You didn't miss anything. It was my bad. It had been corrected. Thanks for pointing that out! My hubby had a dish recently at a Thai restaurant in Palo Alto, CA, which was DELICIOUS, & which i was hoping to be able to recreate. 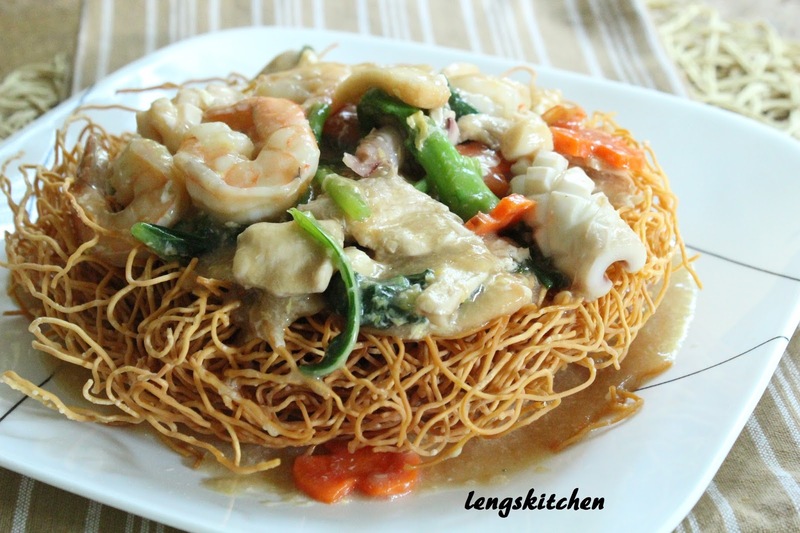 It was simply called "Seafood Bird's Nest", so i went on a search for a photo that looked similar. Several linked to restaurant sites, or critiques of restaurant dishes - so, no help whatsoever!! Then i saw the photo of your dish above, & thought, "Well, that looks a great deal like it!" ...Imagine my delight when i realized that your photo actually led to a RECIPE!!!! His dish had more veggies, & no squid or tofu, but it is quite close! Great recipe. Taste like in the chinese restaurant.thanks for the step by step instructions. You are the Best.